The sun was far from coming up when I was standing on the corner of 10th St in Antioch waiting on Villainz car club member Scott Coppack to pick me up. The night before I told Scott I would love to help the guys set up around the House of Style booth which feature phenom pinstripers-slash-painters Kyle Martin and John Christensen. Come to find out Scott had already pulled in to the show and was setting up. If it wasn’t for Villainz John Lemoine with his sweet burnt orange 49 and his keen eye for black sticker-mobbed camera cases I probably would have been out in front till they let the public in. Well… probably not, but you get the picture. Upon entering the show, we grab our swag bag, pay the reggie fee and head to our designated area, which I might say was quite perfect! 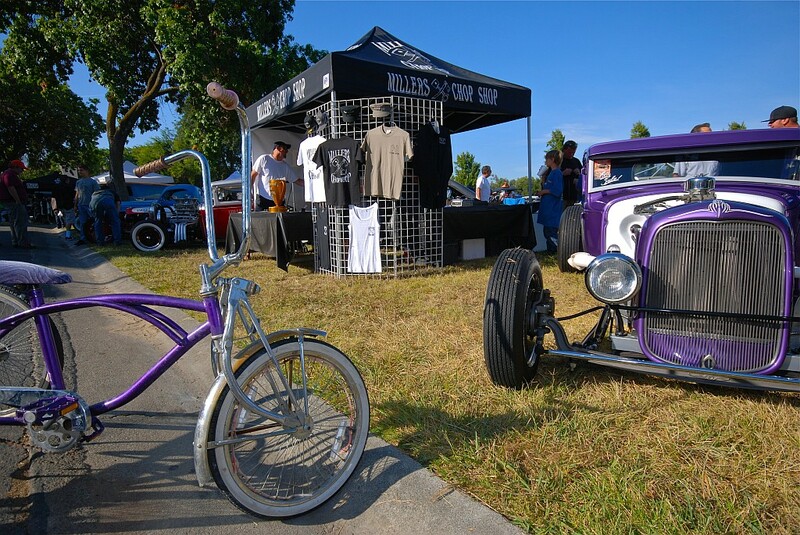 Under shade trees, right across from pinstriping mad men Rich Luna and Mr.Wims booth and their neighbors custom cycle fabricating kingpins: Behind Bars Inc. Looking to your left and you have the Road Lords charity pin-up dunk tank, which I might add was a huge hit! With all the proceeds going to the Scarlet Fever Fund and your shot at dunking a trash talking pin-up, come on!. When there’s a charity involved, you will usually hear the Road Lords name in the same sentence. 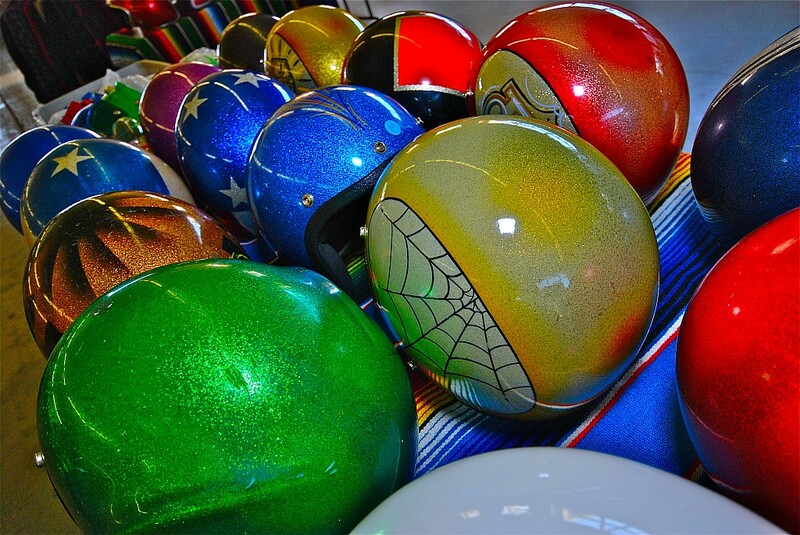 As we razz Scott about this morning, we helped get all the outstanding pinstriped and flaked art pieces from the trunks of Kyle and John ride. Safeway bear claws and the scent of Starbucks filled the morning air as the sun started to peak over the hills of Antioch. The rest of the guys pulled the coolers filled with margs, pop ,chicken, tri-tip out of the rest of the trunks for the BBQ later. Around 7:30 AM, I broke away from the pack to scam out how the this years show was going to shape up. By 8:00am it was already looking jam packed and the gates didn’t open to the public till 10:00am. You could just feel it in the air that today was going to be special. I returned to where I had my photo equipment and started to get ready for the shooting frenzy. I figured that I could get a jump on things and grab my first pin-up shoot with the lovely Olivia Freda before they started letting the crowd of custom rod spectators in. As I roamed the back of the fairgrounds snapping up some shots of the custom collective, I grabbed Olivia and headed back where the Persueders car club was set up. We proceeded to shoot with Persueders CC, Danny Dornan’s super bad green 61′ Chrysler Newport and Ki Hansens burnt orange 56 Merc. After the very cool photo shoot I rolled around snapping more pics of the show. 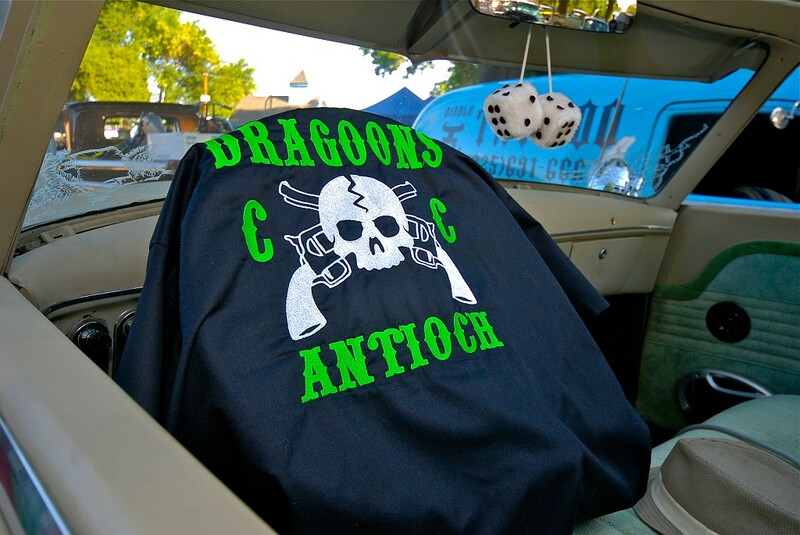 While making my way back up to the front of the fairgrounds I turned around to rap with some of the hosting car cult of Billetproof, the Dragoons, and I noticed in the span of two hours all the rides I shot doubled in size. I still had the whole front of the fair to shoot. This was going to be big. 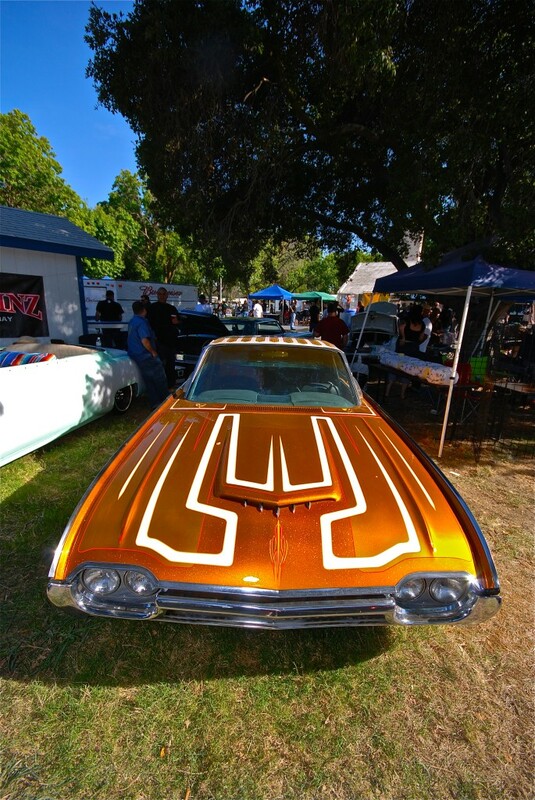 When I pulled up to my rest spot, aka John and Kyles House of Style paint & pinstriping booth, I looked around and noticed that the public was being let into the show. “Holy smokes, it’s 10;00!” I really had to pick up the pace before I had no room shoot. I put back the last of my Starbucks and got on it. The Road Lords pin-up dunk tank was starting to fill up with eager spectators and pin-ups waiting to cool off from the soon to be scorching day at the show as I passed by. Oh yeah, you know I was going to stop back by for a few throws for the Scarlet Fever Fund. I made my way to the front of the fair and started to work my way back. Passing the stage where the bands and pin-up contest will be held and a more vendors than you can shake a stick at I noticed that Millers Chop Shop made it up from Reno, NV, so you know it was a must to snap a few off of their custom creations. I decided to head towards the inside vending area to catch some cooling off cause the Antioch heat was starting come on strong and I promised my oldest that I would get her a show shirt. I stepped inside and swooped up a couple of stickers, Billet 2011 patch and a show shirt for Mia. I noticed that they had the DVD’s this year again and I figured what a great photo op if I slapped down a MyRideisMe sticker right in the middle of all the Billet-propaganda. 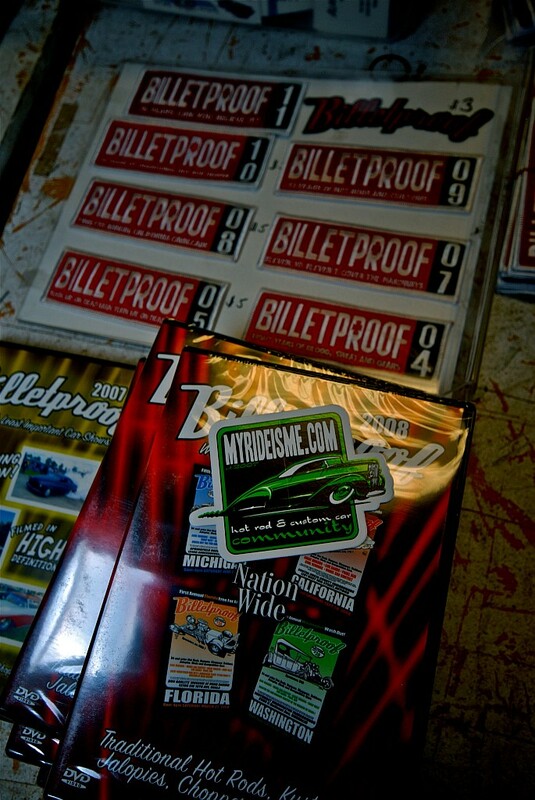 Billetproof had two indoor area’s with a ton of cool vendors. Not only where they indoors but outdoors as well. I would say 50+ vendors spread through out the show. 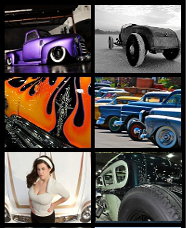 Vendor wise, Billet hit on every gamut of the custom culture scene ranging from hand built mini rat rod cars and old school flaked cycle helmets to vintage clothing and accessories to hair styling for the gals and hair cuts for the guys. If you where hungry or wanted to quench your thirst there was fare everywhere! 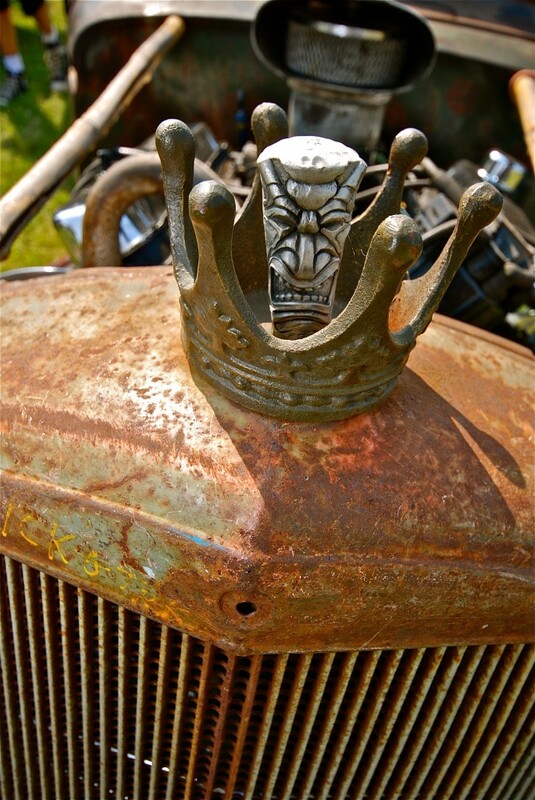 From the BBQs of the many car clubs in attendance to totally cool carney food. I decided to head back over to where the Villainz car club was set up right in front of The House of Style. 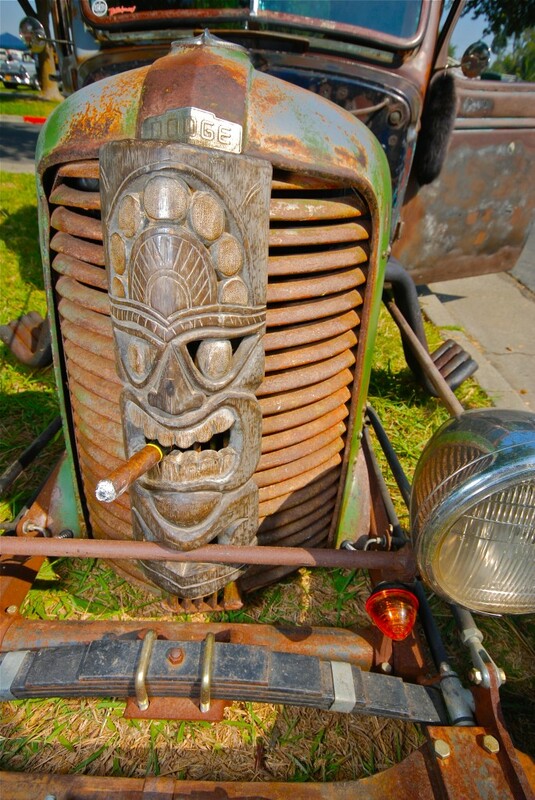 I parked it for a minute, cracked open a well needed ice cold marg and chopped it up with the gang for a bit. Every time I turned around, I saw more rides, more clubs and more spectators. The crowd grew every minute! 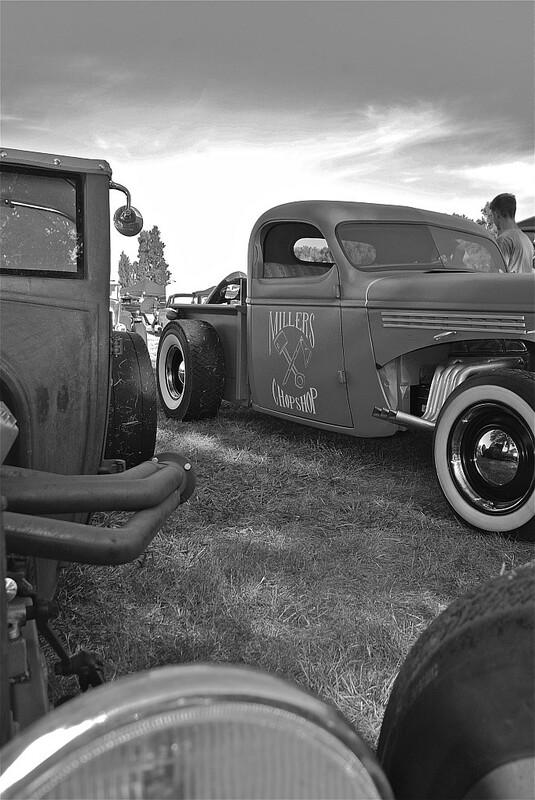 Throughout the day I must have made several trips around the fairgrounds and I still don’t think I got every thing Billetproof had to offer. By 1:00 PM the show was going at full bore. 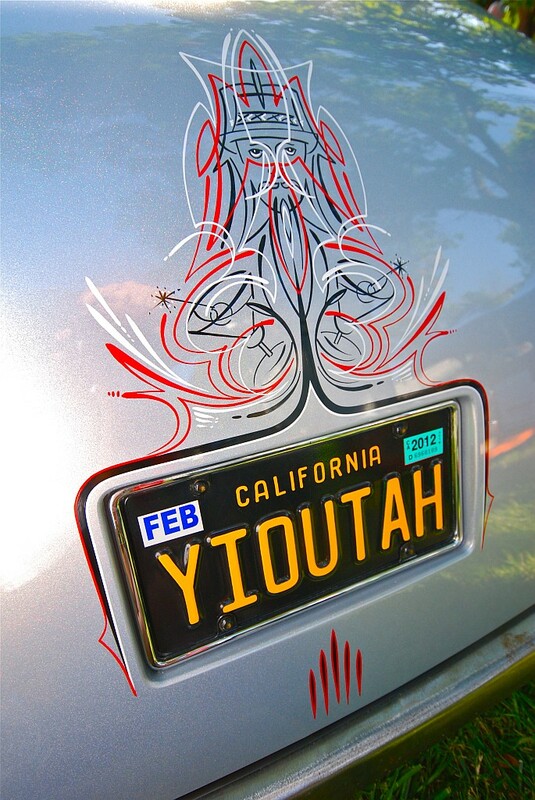 The dunk tank was packed to the gills, the pin-up contest was firing on all cylinders, the music was grooving and crowd started to look like a hot rod red carpet of who’s who in the bay area rod scene. That was probably why I ran into some of the A list photogs that the left coast had to offer. The likes of Mitzi and Co, Marilee Caruso, Chris Gomez, Lilly Fuentes just to name a few. Of course with names like that behind the lens you knew the cast of characters the show brought in was going to be big time. Big time it was! You had just about every car club in a 300 mile radius of Antioch. 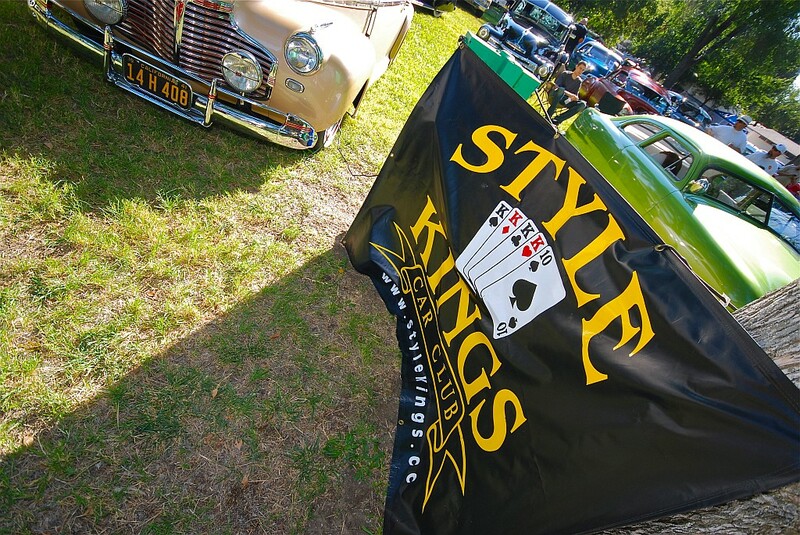 Clubs like the Style Kings, Beatniks, Swanx, Road Zombies, Dragoons, Road Lords, Villainz, Persueders, Road Knights, Alley Cats, Relentless, Jalopies and Satans Chauffeurs where just some of the names. 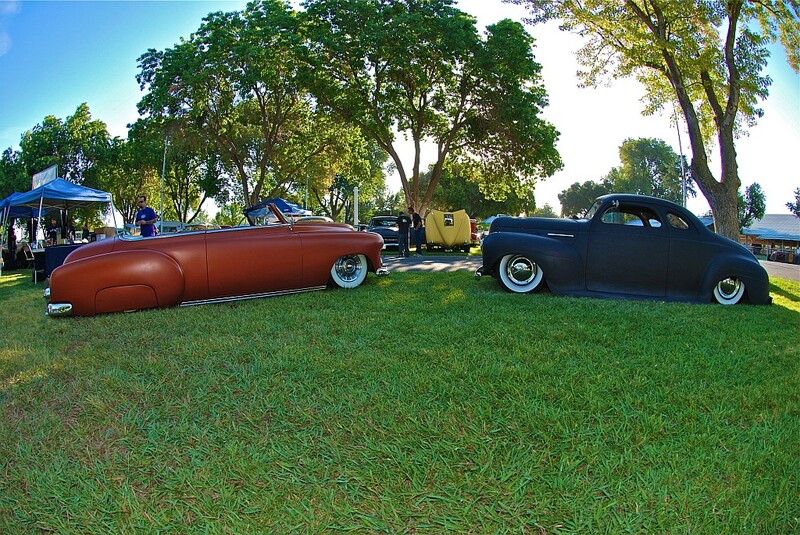 Along with the clubs brought the mad fabricators like Skoty Chops, Alex Gambino and the gang from Millers Chop Shop. Not to mention a Papa Het sighting as well. For those of you that don’t know who Papa Het is, he also goes by James Hetfield. Yeah, the James Hetfield. After the Pin-Up contest, I roamed the show for some more shots and I noticed founders of NorCal Knockout Korena Goldstien and Hollywood Hank talking shop with long time Swanx guru Gunar Hansken. I had to step over and say what’s up, plus I had to ask Gunar a few things about the upcoming Fall Fiasco on Oct 8th. You know MyRideisMe will be all over the all you can eat taco bar that day! After a brief visit (sorry guys, I wish I had more time) I was off to continue my scheduled shoots. Pin-up/pin-striper Trisha Turner was next. Trisha is always a blast to shoot with. Not to take anything away from my other shoots w/ Kara Jeppeson, Brittany “Dixie” Cervantes and a mini shoot with Ms.Megan Taylor. What a day today was! 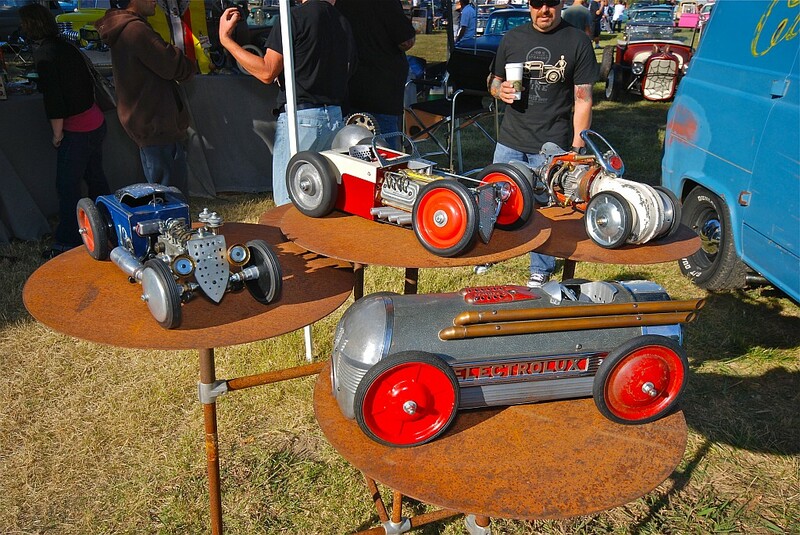 Going on my 11th hour at Billetproof 2011, the rides began to pull out of the fairgrounds. The spectators that where not staying for the after party where heading to the parking lots. The vendors had already started breaking down their booths, the bbq’s where being packed up and good-bye’s where being handed out. Speaking for myself I think this show was a great success. There wasn’t one bad vibe all day. 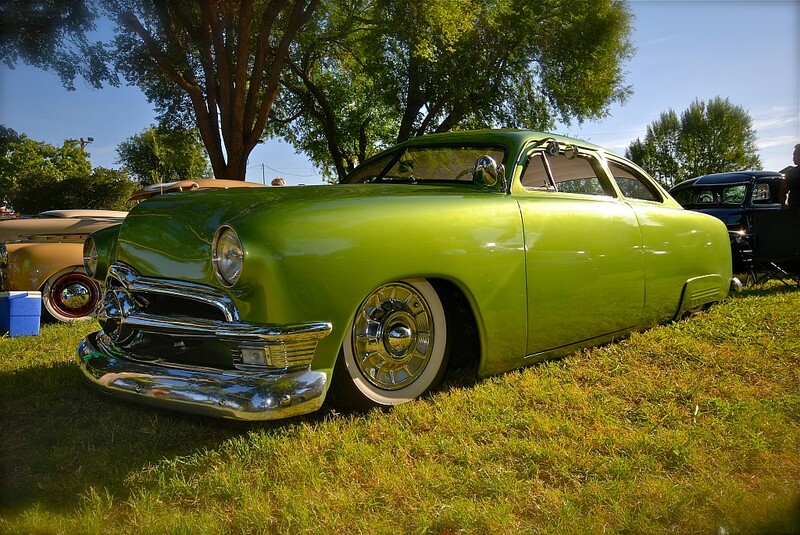 Yeah it was a scorcher, but the feeling through out the whole car show over came the weather. When I arrived at 6:00 am I felt that today’s show was going to be special and I was right. 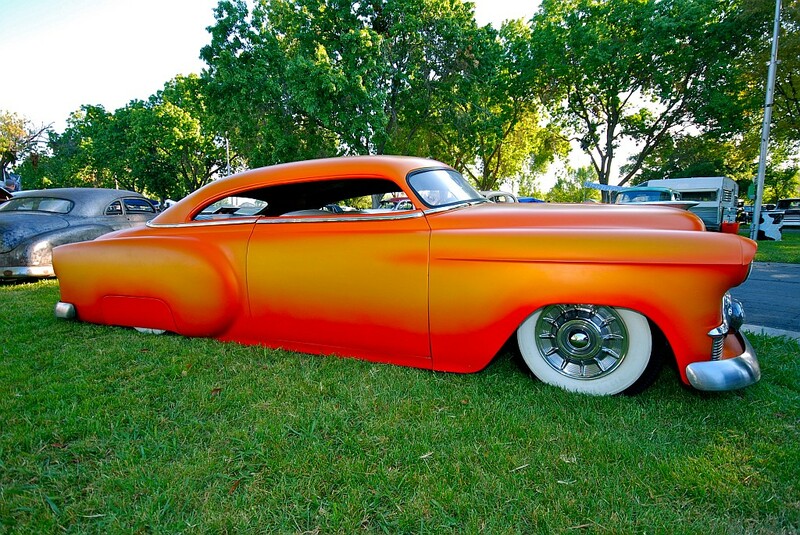 It was 5:30pm west coast time and Billetproof 2011 was coming to a end. 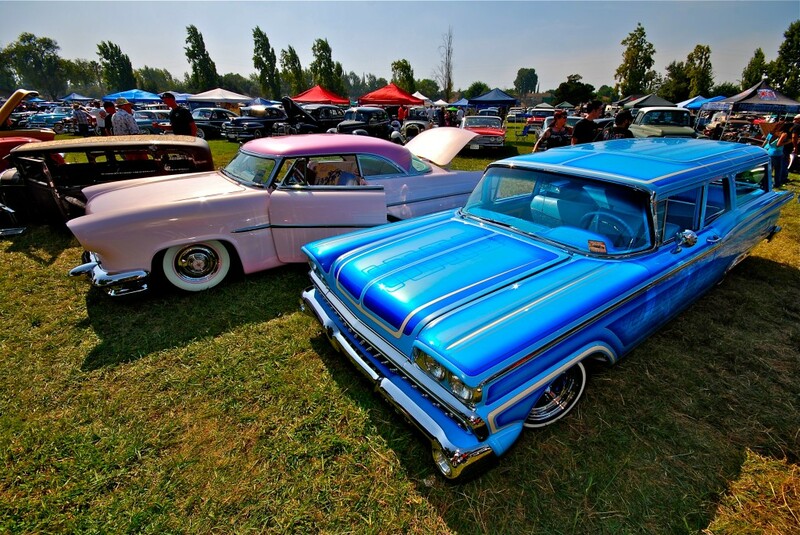 In a way it was kinda sad because here in Northern California, Billetproof is the last big show of the car show season. 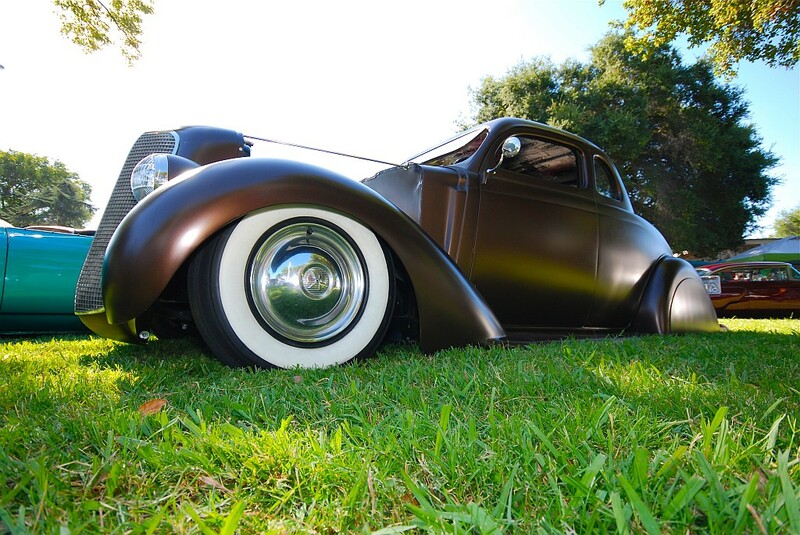 Billetproof just proved again how big the Northern California hot rod scene has become over the years. After all the great shows of 2011 like NCKO,The Road Zombies BBQ, Kings by the Bay, The Gambino Sit Down, Skoty Chops Shootout, The Strangers show, Midnight Mass, Nite of the Hot Rods and the show that signifies (IMO) the end of the car show season Fall Fiasco, to see all those clubs and rod enthusiasts from all those shows gather for one last big bash is amazing to me. 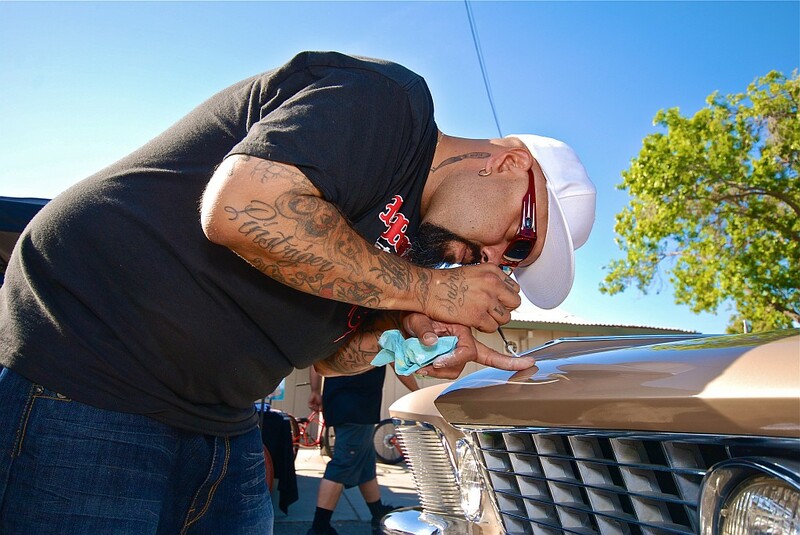 This was my fourth trip to Billetproof and this was the biggest turnout I’ve experienced. I have to say the host club Dragoons car cult did a spectacular job on everything. This was the kind of show everyone will be talking about for a long time. Just a couple days after the show I shot a text over to Dragoons cult leader Max “Stashman” Ballesteros and asked him what kind of numbers Billet closed with. His reply was, ” 1000 plus cars. We got rid of all the registrations cards after that, it was a record breaking attendance for both cars and spectators, I can tell you that!” Not surprising. Hell of a way to celebrate your 15th anniversary! Thanks for sharing you time at the show. I laughed at your comment. I’m approving it do others can laugh too.